Three years ago, Jaap van Zweden conducted New York Phil musicians in a reconstructed Egyptian temple playing Olivier Messiaen’s Quartet for the End of Time. Last night, that same work had an equally “spiritual” venue, in the crypt of the Church of the Annunciation. Yet one inevitably concludes that this work could be played in Egypt, in a Manhattan church crypt, or in its original, concert hall, a a German prison camp during the Second World War, and the result would be the same Those physical backdrops would evaporate with the very first notes. The 45-minute Quartet transcends geography, duration, time, religion, even the composer’s voice of angels, eternity, dance and immortality. Messiaen’s notes create their own non-lineal geography, make their own logic and follow their own morality. 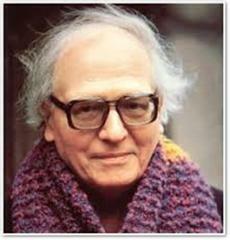 Physical phenomena immediately give way to Messiaen’s metaphysical language. Those first vapid notes from the clarinet have the same unearthly presentiments as the first notes of Stravinsky’s Sacre. The massive chords on the piano behind the instrumental solos are more Old Testament auguries then Messiaen’s New Testament consolation. The virtuoso work on violin, clarinet, cello and piano are less virtuosic than innate inspirations. Just as crypt background was irrelevant (if interesting), the music becomes feeling. 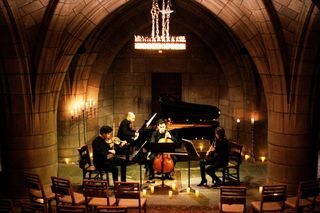 In the concert last night by four amazing musicians, one quickly forgot their artistry in order to hear the inspiration–literally “breathing in the spirit”–of Messiaen’s spiritual flight from his material concentration camp. While Andrew Ousley’s work as a concert manager goes over several spheres, he has created a unique space in the usually morbid sections of New York. Works which border on mortal, immortal and sacred are presented in the abysses of a giant cemetery or in this crypt from a 112-year-old church. While the idea seems eccentric, Mr. Ousley succeeds because he manages to employ the most eminent chamber musicians for the oddball chamber. Last night, his four players exceeded their reputation. Jay Campbell is today the most prominent solo cellist for the most peripatetic music. Yoonah Kim is the first clarinet player in three decades to win honors in the Concert Artists Guild. Orion Weiss, at 37, the “old man” of the ensemble, is always in demand, and the Ukrainian-Korean-American violinist Stefan Jackiw has performed with virtually every orchestra. Theirs was not exactly a “family” like an ordinary string quartet. Their individuality, though, aimed at a music of the spheres, both Pythagorean and mystical. Without my score in front of me in the darkened crypt, I was unable to determine whether 32nd notes were played as 16ths, or whether every harmonic phrase was totally in sync. Yet this was not germane to the effect of the entire piece. One did know that the solos seemed to possess the “right” nuances. Yoonah Kim’s solo in the “Abyss of the Birds” is one of those impossible movements that continue without even the hint of a breath. (Any clarinetist knows the tricks, yet the effect is still gorgeous.) And I did remember how Messiaen had made it more difficult, not only in the desolé sections but in the bird-flight intermezzo, with so many indivdual notes varying from ppp to fff. That was the literal challenge. Ms. Kim played it with the intact phrasing rather than emphasizing each note. Mr. Campbell’s personality was different. His solo was soothing, melodic, lyrical, virtually a Saint-Saëns Swan. (Though the latter would never describe music as “infinitely slow…ecstatic”). Yet it was the repeated chords of Mr. Weiss which commanded attention, we had a tension–the same kind of tension which commits attention from the beginning. The 45 minutes in the church crypt certainly achieved its emotional value by the finale. No questions were asked of its “meaning” or why the “end of time”?” Answers would be both meaningless and endless. Like the Latin sacraments of the Catholic Mass for those who don’t understand Latin, or like the Greek intonations of the Orthodox service for the majority of non-Greeks in the Byzantine Empire, the sounds were their own blessings. With these four musicians, any errors in Messiaen’s score rightly annoy serious critics. For the rest of us, both a respite and immersion were reward enough.